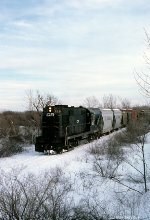 Description: The Lima local is Southbound at Sibley Road as the last rays of sun shine on a late winter afternoon. Description: The Lima local arrives at Rochester Jct. Description: The local to Lima arrives at Rochester Jct. Description: The CR Lima Local heads North on the ex LV Lima Branch at Sibley Road. Description: The Lima local heads North at Corby Road. This location is between Honeoye Falls & Lima.